Congratulations to the Iraqi people and everyone involved in the preservation of the world heritage and culture of Mesopotamia, for the Iraqi Marshes have been officially named UNESCO World Heritage. Its inclusion was approved in the afternoon of the 40th session of the World Heritage Committee held in Istanbul on July 17, 2016. “The Ahwar of Southern Iraq” constitute of seven sites: three archaeological sites which are the cities of Uruk and Ur and the Tell Eridu (remains of Sumerian cities and settlements that developed in southern Mesopotamia between the 4th and the 3rd millennium BCE) and four wetland areas. The Marshes of Southern Iraq are unique, as one of the world’s largest inland delta systems located in an extremely hot and arid environment. The inclusion of the Iraqi Marshes and its associated archaeological sites will not be the end of our work, but we consider it to be the starting point of the long road towards the preservation of the cultural heritage of Mesopotamia. This cultural and natural heritage in Iraq is of exceptional value and is part of global heritage of all mankind. Any demise or damage infected upon it would be a great loss to the world. Primarily, according to Article 4 of the Convention Concerning the Protection of the World Cultural and Natural Heritage of the Year (1972), it is the responsibility of the Iraqi government to ensure the identification, protection, conservation, and education to future generations of the cultural and natural heritage within its territory. The Iraqi government must also, according to the same agreement, take active and effective measures to protect the cultural and natural heritage and adopt a general policy with the aim to give this heritage a function in the life of the Iraqi society, from north to south, and from east to west, and to integrate the protection of that heritage into comprehensive planning programs. According to Article 6 of the same convention, World Heritage protection requires cooperation among all members of the international community, and for States Parties to the Convention to collaborate in the identification, protection, conservation and presentation of the cultural and natural heritage referred to, as well as to make sure no deliberate measures are taken which might directly or indirectly damage the cultural and natural heritage referred to. In this regard, we demand the Iraqi government to open an immediate dialogue with Turkey and Iran to stop the construction of dams on the Tigris River and its tributaries, such as Daryan Dam currently constructed by Iran on Sirvan River (called Diyala River in Iraq) well as Ilisu Dam currently under construction by Turkey on the Tigris River, until their destructive impact on Iraq and its world natural sites such as the Marshes has been thoroughly studied in an impact assessment. Furthermore, we call upon the Kurdistan Regional Government and the Iraqi government for full and integrated coordination between them with regards to the management of their rivers, especially with regards to water facilities or dams constructed on any of the main rivers, since they will have a guaranteed impact on the quantity and quality of water that reaches into southern Iraq. This is in addition to the need for international cooperation to guarantee fair shares of water with neighboring countries Turkey and Syria, in order to make sure the Iraqi Marshes receives the necessary flows of water from the Euphrates River. Since 2012 the Save the Tigris and Iraqi Marshes Campaign has been working to secure broad Iraqi and international support for the inclusion of the Marshes into the World Heritage List. One of its first activities was the campaign’s petition to the World Heritage Committee and the World Heritage Centre of UNESCO, which attracted large attention. This petition was circulated in Iraq and simultaneous campaigns and initiatives were based on it. In the past several years, together with our partners, the campaign has released statements and open letters to the Iraqi Government, and organized a fair number of advocacy meetings and activities that influenced the process leading up the inclusion of the Iraqi Marshes to the World Heritage List. During the whole process, from submitting the file, to its review process, our campaign has always called for transparency. 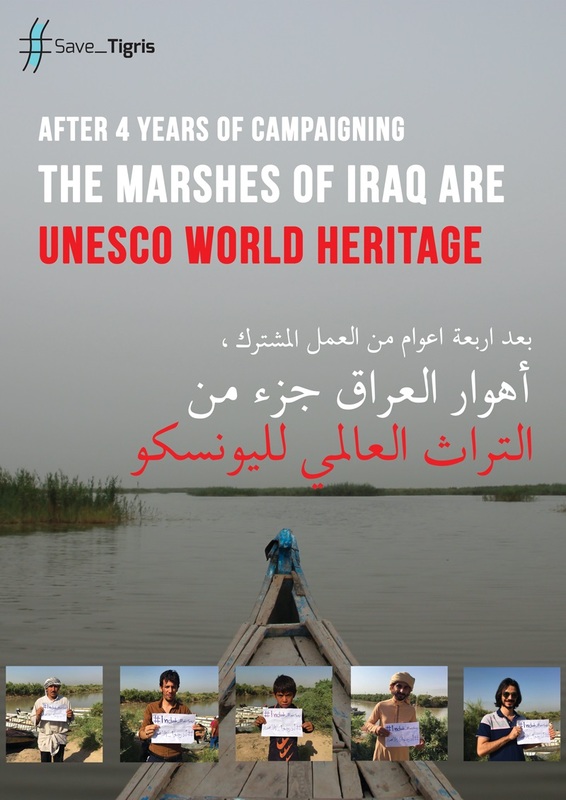 The campaign worked firmly to establish the case of the Iraqi Marshes on the agenda of the Iraqi government and UNESCO, with this success as its result. We believe that the civil society and local communities have a very important role to play in the preservation of the cultural heritage of Mesopotamia and in particular the Marshes. Therefore, we demand the Iraqi government to collaborate with civil society in full transparency. We call upon Iraqi civil society to unite and work together to protect the cultural heritage of the Marshes, in order to pass on the heritage to future generations.